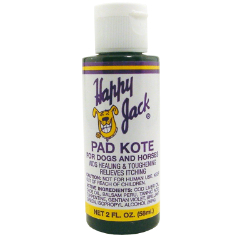 PAD KOTE-HAPPY JACK 2 oz. Pad Kote was formulated to treat the raw, tender, and cracked pads of hunting dogs. It is also a healing aid for all types of wounds, including fungal and bacterial infections of the feet, ears, and elsewhere. Try Pad Kote on cuts, abrasions, sores, burns, tender ears, and hot spots (moist dermatitis). Promotes skin cell granulation and epithelial growth.